Ultimate Addons Fork Stem Mount Attachment with AMPS Plate and Ultimate Addons 3 Prong Adapter is an ideal solution if you already have an Ultimate Addons 3 Prong Holder or Case and wish to mount it to Ultimate Addons Fork Stem Mount. This kit provides the fork stem mount attachment which will fit most centre yoke fork stems of a Motorcycle. There is then the 3 Prong Ultimate Addons Adapter which screws onto the 1 inch (25mm) Ball. More details on the parts included can be found below. 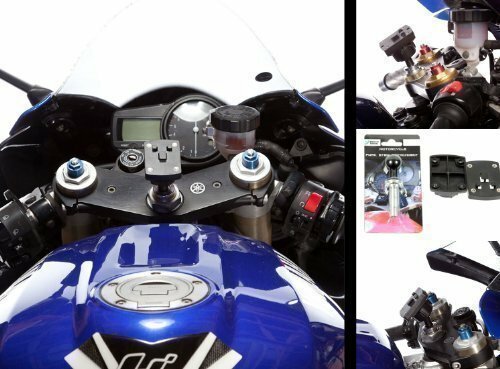 UltimateAddons AMPS adapter allows you to attach a range of popular GPS devices directly to any motorcycle mount manufacturers 1" / 25mm ball system. This attachment can also be used with UltimateAddons connector plates allowing you to mount device holders, waterproof cases and much more. This adapter plate will allow you to connect any UltimateAddons 3 Prong holders or cases. This adapter can be used to allow you to connect Ultimate Addons products to a range of other leading mount manufacturers attachments. Please note that this listing is for the 17.5mm - 20.5mm (0.68" - 0.81") Size of Fork Stem. Other sizes are available from our Shop; 13.3mm - 14.7mm or (0.52" - 0.58") and 15.0mm - 17.2mm (0.59" - 0.68"). If you have any questions about this product by Ultimate Addons, contact us by completing and submitting the form below. If you are looking for a specif part number, please include it with your message.